In personal sketches, Syed Shehwar Hossain takes us back to 1992 when he was just eight year glued to BTV and cataloging newspaper clippings. It's the story of a boy who never stopped dreaming to see his team overcome trials to reach the triumph of World Cup qualification. It all started in 1992. I was then barely 8 years old but was slowly getting addicted to cricket. 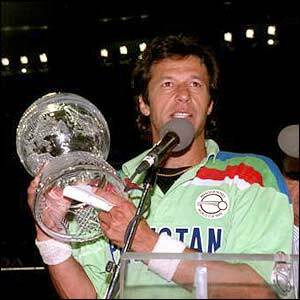 It was the 1992 World Cup that made me fall really in love with the sport. Back in those days we did not have any satellite or cable TV in Bangladesh (or at least in our house anyway!). We had to depend on the good old BTV. I still remember the theme song from that World Cup. It was love at first hearing. If my memory serves me right, the song was "Let's see who rules the world". I saw Pakistan conquering the world after coming in from nowhere. My mom bought me a World Cup special edition of 'Kriralok' (a Bangladeshi sports magazine) after seeing my enthusiasm. I went through the issue word by word and page by page. It was there that I learned that Zimbabwe had been granted Test status after their 9-run shock win over England. A certain Eddo Brandes, who apparently was a full-time chicken farmer, had sent shock waves through English batsmen. The latter, funnily enough, looked like headless chicken trying to chase a target of only 134! I read quotes from past Bangladeshi players saying things like 'now that Zimbabwe has Test status, it would be easier for us to play the World Cup'! I laughed away in ignorance and even read that quote out to my mom. 'What is this Bangladeshi player (I think it was Athar Ali Khan) saying, mom? We will play the World Cup? Have you ever heard a funnier thing?' She laughed too. I was yet to grasp the significance of Zimbabwe gaining Test status. I started reading the sports section of newspapers. It became an addiction. I remember eagerly waiting for the newspaper in the morning and then pouncing upon the sports page. My father tirelessly reminding me that a newspaper is the door to enhancing your general knowledge only if you read the other pages besides the sports page but that somehow always fell on deaf ears. I started learning about our players and would get excited about the domestic players transfers. Days and months go by. By now, I know our players' name by heart and then I read the news about the forthcoming World Cup. The ICC has decided that there will be three associate members taking part in the next World Cup! The top three finishers in the ICC trophy will get to play in the 1996 World Cup! Because I knew, we had finished third in the last ICC Trophy losing to the eventual winners Zimbabwe in the semifinals. And Zimbabwe will not even compete in the ICC trophy! Finishing in the top three should be a piece of cake! Every day, before going to bed, I would make up virtual scenarios where we were beating one cricketing super power or the other. Every day, before going to bed, I would make up virtual scenarios where we were beating one cricketing super power or the other. The world is praising Bangladesh and its promising cricketers. As I kept on dreaming there were hints from the ICC that if Bangladesh were to qualify, they will also get to host some of the 1996 World Cup matches which were to be jointly held by India, Pakistan and Sri Lanka! We were gearing up for the 1994 ICC trophy to be held in Kenya where all we needed to do was finish third in order to play the World Cup for the first time. The early signs were encouraging. We beat a strong Sri Lanka A team by 7 wickets bundling them out for just 85 in the first ever SAARC cricket tournament in Dhaka in December 1992. BTV was telecasting the tournament live! This was the first time I saw our cricketers live in action and I was ecstatic. Unfortunately, the tournament was abandoned due to political and religious tensions at the time. Some time later, the then World Champions Pakistan was in Town. They came over to play two unofficial one-day matches. In the first match, Pakistan made 272/3 in 45 overs batting first if I remember correctly and the chase began in the most emphatic manner and most certainly beyond any ordinary Bangladesh cricket fan's wildest imaginations. I remember Athar Ali playing the most elegant of off drives straight past Waqar Younis's first ball for a boundary and that set the tone. It was a special feeling! Pakistan, the all-conquering defending World Champions with the most fearsome new ball pair in the world, was being taken to the cleaners by our own Athar Ali Khan. Both Wasim and Waqar went for plenty and, in the blink of an eye, we were 70/0 in 9 overs! The introduction of Mushtaq Ahmed changed things considerably and eventually we finished at 210/5 but there was a feeling of satisfaction. To see our players in the same field against these giants and hold their own. It was priceless! Predictably, we lost the second match as well. This time by 7 wickets but no one was disheartened and a young Bulbul (Aminul Islam) looked extremely good in both matches and won me over. My passion turned into an obsession. I started going through all the old newspapers dumped in the storeroom at my grandparent's house at Farm Gate, Dhaka. I found the match report of an Asia Cup encounter where Athar Ali scored a 78 not out in a hopelessly one-sided defeat and still got the man of the match award. It made me feel so proud. I would repeatedly read that match report from 'Ittefaq' (a Bengali daily). I would daydream of the day when we might actually get to play international cricket regularly and may be, just maybe, run one of these teams close one day! Then came the 1994 ICC Trophy. We went into the tournament as one of the pre-tournament favorites and were highly fancied to qualify for the 1996 World Cup. We had five teams in our group the top two was to go through to the second round. Us going to the second round was almost a certainty but everyone who was following Bangladesh cricket at the time was anxious about-facing UAE and with good reasons too. The UAE side was really a combined India, Pakistan and Sri Lanka expat 11 in disguise. All of their players had strong first class cricketing experience and quite a few of them had even represented their national squads previously. There was just a single UAE born player in their entire side. And we had our first hiccup! They easily beat us by 6 wickets. We finished second in the group behind them and ended up in the tougher group for the second round with top favorites Netherlands and host Kenya. Hong Kong completed the group and they were just happy to make it to the second round. All of a sudden, we started to feel the pressure. The top two from our group would make it to the semifinals, which meant one of the fancied teams was going to miss out. The defeat to UAE had completely turned the competition on its head. Rather than being in the other group with lower ranked Bermuda, Canada and Ireland we ended up with Holland and Kenya. The anticipation was building and so was the anxiousness. The lead up to the tournament didn't help either. Our coach Mohindar Amarnath had made quite a few questionable decisions in the lead up to the tournament, most noticeable one being the appointment of Faruk Ahmed as the skipper. The team did not seem to have any solid plans either. One day Athar would open the batting and the very next day it would be Faruk Ahmed opening and then the following day someone else would pair up with Jahangir Alam! The same was happening with our bowling with even Nannu (Minhazul Abedin) opening the bowling with Prince (Golam Nowsher) or Athar pairing up with Dulu (Jahangir Alam Talukdar). It all seemed very chaotic and I, along with all Bangladeshi cricket fans, started to have serious doubts over the coaching skills of Mr. Amarnath. The big game came and went and we went down to Holland. The bowlers had done well to restrict the Dutch side to 205 in spite of using yet another new opening bowling pair of Dulu (Jahangir Alam Talukdar) and a young 17-year-old left arm spinner named Sharfuddoula Ibne Shaikat. But our batsmen failed miserably and we folded for only 158. I was depressed the entire day but was still secretly hoping that we will beat the Kenyans. I severely started to dislike our coach. None of the players seemed to know their role let alone which position they will bat. Of course, the newspapers at home remained my only source of team gossip and there were rumors of unrest within the team. Anyway, Judgment Day was beckoning. Us against the Kenyans on their soil. Millions of us were to follow the match on the radio. The dream of playing in the World Cup would die an untimely death if we lost to the Kenyans. I still remember every single moment of that match so well! After all these years of amazing TV coverage, I feel it still can't match the intensity we had listening to the matches on the radio back then! We won the toss and elected to field and things seemed to be going fine until the halfway mark of the Kenyan innings. I believe they were 74-2 after 25 overs. Our bowlers had tied them up well up to that point. Their captain Maurice Odumbe then suddenly took a liking to our slow bowlers and was tirelessly launching them out of the ground one after the other. Young Sharfuddoula Ibne Shaikat was taken to the cleaners while Moni (Enamul Haque) and Nannu (Minhazul Abedin) also had bowling figures not to be proud of. From 74-2 at the halfway mark, Kenya ended up with 295-6 after 50 overs! Our commentators were probably feeling just like us. For our younger audiences to comprehend the gravity of the situation: back in those days, a total of 280+ in a crunch match would be comparable to scoring around 350 now. It's almost like batting out the opposition. Our reply started with yet another surprise; this time my favorite Bangladeshi player Bulbul (Aminul Islam) coming out to open with Jahangir Alam. They started confidently with Bulbul (Aminul Islam) being the aggressor and we started to dream once again. The opening pair went past 50 in good time and then went on to complete the century partnership. 139 without loss in 24 overs! Bulbul (Aminul Islam), the makeshift opener, was playing a gem of an innings and scoring more than run a ball while Jahangir Alam was giving him solid support. Jahangir got run out and then the very next ball Tom Tikolo apparently took a catch of a lifetime to dismiss Bulbul (Aminul Islam)! Jahangir gone for 57 and Bulbul (Aminul Islam) gone for 74. Nannu (Minhazul Abedin) and Akram Khan kept us on the hunt for a while but when they departed, the hopes started to fade away. We ended at 282-8. A mere 13 runs short. It was a gallant effort but the dream had ended. There was this strange feeling of emptiness. I was barely 10 or 11 years old and could not hold back my tears like many who followed our team back then. All those endless nights of fantasies of Bangladesh competing at the world stage was going to remain a dream. It was the lowest point of our short cricket history. Eventually we moved on. The domestic circuit was as exciting as ever. We regularly had crowds exceeding 25 to 30 thousand in the big clashes featuring Abahani and Mohammedans. Cricket was well and truly alive. Along came the second SAARC cricket tournament. India , Pakistan and Sri Lanka sent their A teams to play alongside our national side being led by the burly Akram Khan. There was plenty of interest in the tournament as all the A teams featured household names. Pakistan was led by Ramiz Raja, who by then was quite a star himself having played a significant role in their World Cup triumph. They also had the likes of Zafar Iqbal and Zahid Fazal in their ranks. Team India had multiple stars. Just to name a few: Saurav Ganguli, Rahul Dravid, Venkatesh Prasad, Pravin Amre, Rajesh Chauhan, Salil Ankola, and Vikram Rathour. Most of these players had already played for the national side by then. Sri Lanka had the services of Russel Arnold and were led by Chandika Hathurusingha. I remember hogging the TV every day! The first match was such a heartbreak! We lost to the Pakistanis by 1 wicket! Chasing 168 to win Pakistan needed 1 run of the last ball with Mohsin Kamal on strike. Anisur Rahman was bowling the last over. I remember just as Anis was approaching to bowl the last ball he suddenly stopped his run up before releasing the ball with the non-striker stranded out of his crease. He showed unbelievable sportsmanship by not running the non-striker out. To this day I regret Anis not running him out as then it would have been a tie. Anyway, to add insult to injury, the last ball was a brilliant one as the batsman failed to get a bat on to it but our wicketkeeper fumbled to gather the ball! Pakistan ran a bye and went on to win by the faintest of margin. Just kept on asking God: 'Why? Why is it always us?' But as it turned out better things were to come. We got past the Sri Lankan side with considerable ease beating them by 5 wickets. Anis and Saiful Islam cleaned up the Sri Lankan side grabbing the last 5 wickets for the addition of just 1 run! Anisur Rahman once again was the pick of the bowlers with 4 wickets. By the now the tournament was the talk of the town. Bangladesh had been extremely impressive going into the last group match against India, who was arguably the strongest side of the tournament. And boy was it a match to cherish! Bangladesh finished with 172 with Bulbul (Aminul Islam) making a solid 64. It wasn't a bad total on a low and slow Dhaka wicket. And it turned out to be a match winning one! We won the match by 1 run, with Mohammad Rafique grabbing the final wicket of Venkatesh Prasad stumped by Jahangir Alam. Rafique grabbed 3 wickets and Anis was turning out to be a bit of a sensation grabbing 3 wickets again. The whole country went berserk. Actually, we had never stopped dreaming. It was such an emotional moment in our short cricket history. This was an extremely strong India side with quite a few of the players with big reputations. And it meant a lot to all of us. We eventually lost to them in the final and finished runners up but that was no mean achievement. Anisur Rahman finished the tournament as the top wicket taker and Akram Khan had established himself as an inspiring leader. We impressed further against an England A drawing against them in a 3-day game. The highlight was the 175+ run partnership between Bulbul (Aminul Islam) and Nannu (Minhazul Abedin). 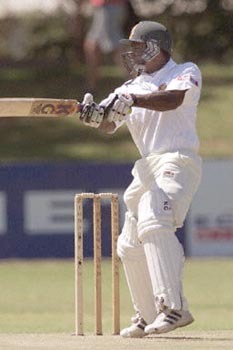 Bulbul further enhanced his reputation with a magnificent 121 against an attack led by Dominic Cork. We then went on to play the 5th Asia Cup held in Sharjah. This was yet another memorable milestone moment of me following our national side. This would be the first time I would be watching our national side play full ODIs and that too, live on satellite channel (Star Sports) with the likes of the legendary Sunil Gavaskar commentating on our match. Trust me; it was a big deal back then. Predictably, we went on to lose all the matches comfortably. There were a few positives here and there. Bulbul (Aminul Islam) looked classy in his little innings of 30 against India. I still remember Sunil Gavaskar praising him when he played two magnificent square cuts against Manoj Prabhakar for four and lofted Utpol Chatterjee straight over his head for an effortless six. After that little innings, Clive Lloyd had a word with Bulbul and praised him as a compact batsman. A young Shanto (Hasibul Hossain) Bowled Roshan Mahanama with an unplayable delivery on debut to leave them tottering at 8-2 and eventually bowled Sri Lanka out for 233 on a placid Sharjah pitch. Saiful Islam claming 4-36 was the best bowling figures by a Bangladeshi bowler then. Cricket was now slowly but surely taking over from football as the number one sport. During this time, Kenya came in for a visit in preparation for the 1996 World Cup to be held in subcontinent. They were promptly whitewashed 3-0 in an unofficial ODI series. They went on to lose every single match they played on that tour which included a defeat to our under-19 side. The 1996 World Cup that was won by a rampaging Sri Lankan side sparked further interest in cricket among us. And, by then cricket was our number one sport. In September 1996, we participated in the ACC cup. The winner of the tournament was going to earn the right to play the next Asia Cup along with the big three Asian sides (India, Pakistan, and Sri Lanka). This tournament was of particular significance not only because we had been participating in the previous Asia Cups regularly but also because it featured UAE, a side that had beaten us at the previous ICC trophy to deny us a World Cup birth. The semi-final and the final were telecast live on Star Sports. We won the tournament comfortably by beating UAE by more than a hundred runs and earned the right to play at the next Asia Cup. It was a big morale booster ahead of the next ICC Trophy. 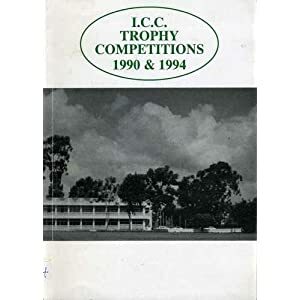 The appointment of Gordon Greenidge as national coach was a popular one and we started preparing for the 1997 ICC Trophy, the qualifying event for the next World Cup. Once again, the criteria were the same. The top three teams earn the right to play at the next World Cup to be held in England in 1999. The tournament was going to be played in AstroTurf as opposed to the traditional pitch and would be held in Kuala Lumpur, Malaysia. The Bangladesh Cricket Board ensured we were well prepared by laying out AstroTurfs for our players to practice on ahead of the big event. Along came the month of March in the year 1997. I was a in the 8th grade then. I knew this was big. It was now or never for the very existence of our cricket. There was a lot of build up to the event. The expectant fans would be scarred like never before if we didn't make it to World Cup. As I am walking down memory lane, I suddenly remembered a relevant sotry. Back then, we used to play cricket in the afternoons like every other kid our age. There was this kid round about my age who used to stand out all the time. He used to treat bowlers twice his age with little or no respect and used to hit boundaries at will. He was left handed and our circle of friends had given him the nick 'Suriya' as Jayasuriya was quite big back in those days. His name was Abir, better known as Shahriar Nafees who went on to play for the national side and is still actively involved. He had a young brother who was equally impressive for his age. I wonder if he is involved in cricket as well! 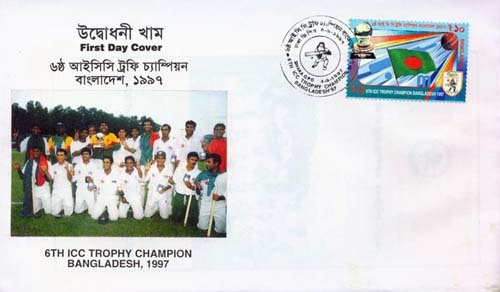 Anyways, going back to the ICC Trophy 1997, I must mention that we had to rely on live radio coverage, as sadly there was no TV coverage of the event in Bangladesh (we did get highlights later on after the tournament had concluded). We were glued to the radio every single second. I remember even bunking classes and staying at home just to listen to the match coverage. We started the campaign in confident fashion breezing past Argentina, West Africa and Denmark with fast bowler Shanto (Hasibul Hossain) in devastating form. Then came our main opposition in the form of UAE. We were quietly confident. We had beaten them by more than a hundred runs in our last meeting and as it turned out, it was the same story again. We beat them by a massive 110 runs all but ensuring our progress to the next stage as group winners. We rounded off the group stage by beating Malaysia in our last match and progressed with a 100% record. In the second round or Super Eights, we were grouped alongside Netherlands, Ireland and Hong Kong with the top two sides progressing to the semifinals with Netherlands being potentially our toughest challenge. In our first match we took care of Hong Kong by 7 wickets with Mohammad Rafique claiming 3-20 and Bulbul (Aminul Islam) guiding the team to victory with an unbeaten 53. The same day Ireland defeated the favorites Netherlands by 5 runs (D/L method) in a massive upset. In our second match, we came up against the Irish. Shanto (Hasibul Hossain) was at his brilliant best as we bowled them out for 129 with Shanto claiming 3-29 and Bangladesh was cruising at 24-0 on the seventh over when the heavens opened up. An almost certain victory was denied. The match was abandoned and we had to share a valuable point with Ireland, who by virtue of this 1 point was almost guaranteed to go through from this group. This put us in a very tricky situation going into the last match against favorites Netherlands. Ireland already had 1 win (against Netherlands) and one no result and was always going to beat Hong Kong and hence would go through from this group. With Netherlands and Bangladesh having 1 win, this was a must win match for both the sides. We were all so anxious heading into that match! We had been in a similar situation last time against Kenya and we all know what happened there. We had started off quite well and restricted them to 171 all out. We began our chase and in no time were looking down the barrel! 1-7, 2-7, 3-13 and 4-15. We were listening in disbelief as the Dutch seamers were ripping the heart out of our batting order. At 4-15 I think I had never ever felt worse in my life. We were still unbeaten in the tournament and were having a fairy tale run and one rained out match against the Irish had almost ruined everything. Akram Khan and Nannu (Minhazul Abedin) were batting in the middle and to this day I don't think I have prayed and promised to the Almighty as much as I did for those next few hours. They started building a partnership slowly and then came another heart-stopping moment when it started to rain. We were way behind in the D/L method and only two more deliveries were required for this to be a legitimate match. After which, if the players went off the field the Dutch would be declared winners by virtue of D/L method! Akram Khan showed immense maturity and started wasting time in all possible manners. He tied his shoelaces, changed his helmet and did everything possible to deny those two deliveries being bowled as he knew once that happens it would be all over if it continues raining and the game was abandoned. There was still 1 ball still remaining for it to be a legitimate match when play was called off! Those were the longest few minutes of my life at that point. Play resumed again and Bangladesh were set a revised target of 141 in 33 overs. Nannu (Minhazul Abedin) got run out leaving us on 77-5. When Enamul Haque went to leave us on 86-6, we were pretty much dead and out! Akram was still fighting though. He had a date with destiny. Saiful Islam came in and just gave him enough support by hanging in there while Akram single-handedly took on all corners. Saiful departed with us just 6 runs away from victory, but Akram Khan was there till the end. He delivered when it mattered the most! The man single-handedly took us to the semi-final of the ICC Trophy with an innings of a lifetime. His 68 not out is still arguably the greatest ever knock played by a Bangladeshi. The magnitude of that innings was epic and everlasting. Bangladesh cricket would not be where it is today if Akram Khan had not rescued us from that situation. The situation, the pressure, and the expectations â€“ he took on everything on his able shoulders and took us to safety. If ever there was a captain's knock, that was it! We never looked back from then on. In the semi-final, Bangladesh easily defeated Scotland to reach the final thus creating history by claiming a birth in the World Cup proper! We celebrated in style! Celebrations that can never be matched or compared. It was the happiest day of our lives. The dream became a reality. WE WERE GOING TO PLAY THE WORLD CUP! We finished the tournament as unbeaten Champions, beating Kenya in an epic final which we won by 2 wickets with Shanto (Hasibul Hossain) scampering through for a single off the last ball. It was the perfect script and the perfect revenge! We had beaten UAE, Holland, and Kenya: the three teams that had beaten us at the previous ICC Trophy in the same order! I would like to take this opportunity to thank all the Radio Bangladesh commentators for doing a magnificent job throughout the tournament. I particularly remember Chowdhury Jafarullah Sharafat for that last over when we needed 11 runs. Every single one his words are still music to my ears after all these years. I still remember that day clearly. My father had just come back from the office. We were all pacing tensely in our apartment listening to the commentary. My mom, who doesn't understand cricket at all, started crying in joy as soon as we had won! We all hugged each other. It was just a joyous spontaneous moment. My father then said "let's have Biryani! We have to celebrate!" and boy, did we celebrate! Everyone in our country came out into the street! People who understood cricket! People who didn't! They all just knew Bangladesh had achieved something massive. Only a lucky few understood the magnitude of what had happened. The rest is history as we went on to gain ODI and Test status. I just feel so lucky to have been a part of our coming of age. I am sure there will be so many more new and exciting chapters in our cricket but no matter what happens in the future, I can die a happy man. This page has been viewed 4670 times.